During the War of 1812, Commodore Oliver Hazard Perry whipped the British in the famous Battle of Lake Erie. Nearly 200 years later, winning Lake Erie won't suffice for Democrats seeking to reclaim the House; they need to win on the shores of all five Great Lakes. Now that decennial redistricting is nearly over, we have a relatively complete picture of where and how the race for the House will be run. While there are hotspots all over the country, the key region that will determine future control of the House is a combination of the Midwest and the Northeast -- the eight states that touch the Great Lakes: Indiana, Illinois, Michigan, Minnesota, New York, Ohio, Pennsylvania, and Wisconsin. Of these eight, Republicans controlled the redrawing of House maps in five of them -- Indiana, Michigan, Ohio, Pennsylvania and Wisconsin -- after the 2010 census (courts drew the maps in New York and Minnesota, and Democrats controlled redistricting in Illinois). In other words, if the race for the House truly comes down to the Great Lakes states, Democrats will have to break some Republican-drawn maps. This is, needless to say, a daunting task. Before examining that task in more detail, the charts below show the current state of play in the House. Chart 1 shows rating changes we've made since our last full House update (Jan. 19), and Chart 2 shows our current Crystal Ball House ratings. Notes: *This seat is changing from AZ-8 to AZ-2 under the new Arizona map, but a special election to replace Giffords will be contested under the old AZ-8 lines, which are slightly more favorable to Republicans. Seats in bold are ones where the incumbent party is not favored to hold the seat. To understand the importance of the Great Lakes states in the race for the House, it's important first to assess the national picture. According to the Crystal Ball's latest House ratings, only 101 of the 435 House races are competitive to any real degree. Republicans start off with 185 seats we judge to be safe, and Democrats start off with 149. Democrats need a net gain of 25 seats to retake the House because Republicans hold 242 seats in the current House, which is their biggest majority since after the 1946 elections. If they had 242 seats in the next House, they would be ecstatic. That does not mean, however, that Republicans won't pick up some seats currently held by Democrats. When you factor in those, the hill gets steeper for Democrats. Outside the Great Lakes Eight, eight Democrat-held seats lean toward the Republicans at this point (those are the seats in bold on the competitive race charts above). Let's give Democrats the benefit of the doubt in three of those seats: conservative but ancestrally Democratic OK-2; IN-2, where Democrats like their likely nominee; and IA-3, where Reps. Tom Latham (R) and Leonard Boswell (D) are locked in a potentially close content. 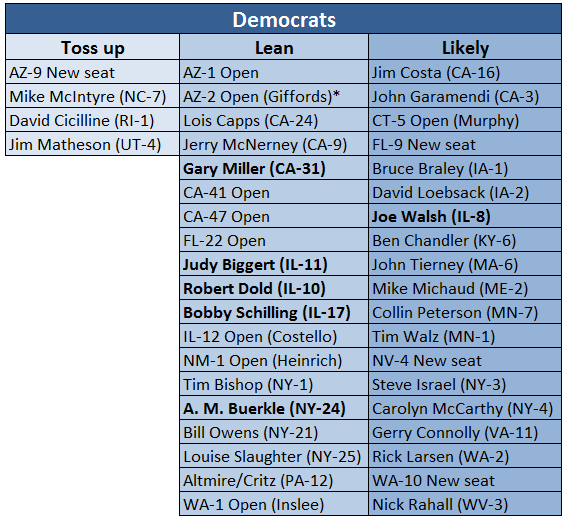 If Republicans win the other five currently Democratic seats -- and effectively no more (we'll give Democrats the three toss up incumbents listed on the Democratic chart) -- that means Democrats need to win 30 seats to take the House. One more thing: After the census, 12 seats were taken from states with low growth. Of the eliminated seats, seven were held by Democrats and five were held by Republicans (this list includes the Boswell/Latham race, where we favor Republican Latham but are giving the benefit of the doubt to Democrat Boswell). Those 12 seats were then shifted to states that grew over the past decade. Assuming that Democrats win new seats in Arizona, Nevada and Washington, those 12 seats split six to six between the two parties. That's a long way of saying that Democrats lose another seat out of this exchange, which puts them 31 seats away from a majority. So where can Democrats find 31 seats? Let's start on the West Coast. The new House map in California gives Democrats the edge in a number of new places. While the California delegation is now 34-19 Democratic, let's assume that Democrats win all the seats that lean toward them in the Golden State, along with all the toss ups. That nets them four seats. East and south of California, let's give them one pickup apiece from Colorado, Arizona and Nevada. While this assessment and the assessments to come are intentionally very rosy for Democrats, they are not totally out of the realm of possibility, either. Continuing their string of good fortune moving further east, let's give Team Blue the important race in Republican-held TX-23, the only truly competitive race among Texas' 36 House districts under the Lone Star State's new map. That gives Democrats a net gain of one seat there. Back on the East Coast, let's also say Democrats have a good Election Day in Florida, defeating the scandal-plagued Rep. David Rivera (R-26) and capturing not only the seat of the controversial Rep. Allen West (R-18), but also West's old seat (FL-22 -- West moved to a more favorable seat after redistricting). By this estimation, Florida goes from 19-6 Republican to 17-10 Republican -- Democrats and Republicans each split the two new seats added after the census, and the Democrats net three seats. Moving up the coast, let's also give Democrats Rep. Roscoe Bartlett's (MD-6) seat, and both seats in New Hampshire, which might flip back to Democrats in the always volatile Granite State. Finally, moving back west along the Canadian border past the Great Lakes, let's say Democrats spring an upset in Montana, taking back that state's at large House seat. Under this generous scenario, Democrats conquer 15 competitive Republican-held House seats in the 42 states that don't touch the Great Lakes -- or close to half of the 31 they effectively need, assuming the Republican pickups detailed above. That brings us to the Great Lakes. The Great Lakes states: A Republican firewall? We've known for months that Illinois, one of the first states to complete redistricting, was going to greatly help Democrats in their efforts to take the House. Our ratings currently favor Democrats to pick up four Republican-held seats there. That brings the Democratic total to 19. Even after the courts recently redrew New York's map, the Empire State's House picture is hazy. Given that the courts effectively eliminated one Democratic seat (that of retiring Rep. Maurice Hinchey) and one Republican seat (2011 NY-9 special election victor Rep. Bob Turner, who is now running for U.S. Senate), the delegation becomes 20-7 Democratic, effectively unchanged from its current 21-8 makeup. Democrats and Republicans look likely to trade pickups upstate -- neither Reps. Kathy Hochul (D) nor Ann Marie Buerkle (R) are favored to keep their seats under the new maps. That still leaves Democrats without a net gain in the state. For the sake of argument, let's say Democrats can knock off two of the four Republicans we have rated in the tenuous “leans Republican” category while protecting their own vulnerable incumbents. Democrats are now up to 21 seats gained. But that's when Democratic momentum, even under a highly favorable scenario, starts to sputter. In five of the six remaining Great Lakes states -- Indiana, Michigan, Ohio, Pennsylvania and Wisconsin -- Republicans drew the redistricting maps (Minnesota is the exception). While they weren't able to eliminate many Democrats, Republicans were able to shore up their own incumbents. In these six states, we rate only two Republican incumbents as toss ups -- freshmen Reps. Chip Cravaack (MN) and Jim Renacci (OH). Of the two, Cravaack is more vulnerable, as his seat is one Barack Obama would have won by eight points in 2008; meanwhile, Renacci, though he is running against fellow Rep. Betty Sutton (D), occupies a district that would have slightly favored John McCain. Again, let's give Democrats the benefit of the doubt here, moving their pickup total to 23, or eight short of the magic number of 31. With Democrats having come close to maxing out their gains across the country, and limiting Republican gains elsewhere, the race for the House would come down to whether Democrats could win eight more seats out of the Great Lakes states -- and Republicans at this point are favored in all the remaining competitive seats. Just look at the red chart above. While the “leans” and “likely” Republican columns are littered with representatives (many of them freshmen) from Indiana, Michigan, Ohio, Pennsylvania and Wisconsin, nearly all of them got help in redistricting. 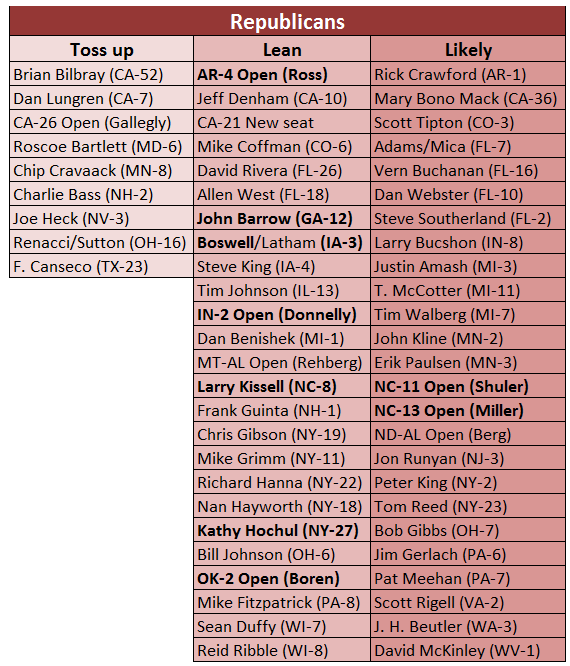 And of the GOP representatives from the states mentioned, only five of them are in the “leans” column. So even if the Democrats really had a knockout day in these Midwestern states -- defeating “leans” Republican Reps. Dan Benishek (MI), Bill Johnson (OH), Mike Fitzpatrick (PA), and Wisconsin's Sean Duffy and Reid Ribble -- that only gets them to 28 Republican seats won, or three short of winning the majority. And, again, these are seats where Republicans are currently favored. There's a reason why many analysts and House-watchers -- including some Democrats -- believe that while Team Blue should pick up around five to 10 House seats, they have very little chance of winning the House. The reason is that even if Democrats overperform -- which would almost assuredly mean that President Obama was also rolling to a fairly easy reelection -- they would still have to crack new Republican or court-drawn House maps, many of which are situated along the shores of the Great Lakes. Even if Democrats come close to maximizing their gains across the country while limiting the Republicans -- a scenario much along the lines of what's described above -- the math, and the map, is daunting.